On December 1st, 2018 the newly formed Manchester chapter –MCR Punks For West Papua will officially launch in the U.K. The MCR Punks team will be ‘Drumming for Freedom’ to raise awareness about the ongoing genocide happening in West Papua. The first bands to take up the mission in Manchester are The Blinders, The Membranes, Fever Witch, and MFU (Modern Family Unit). 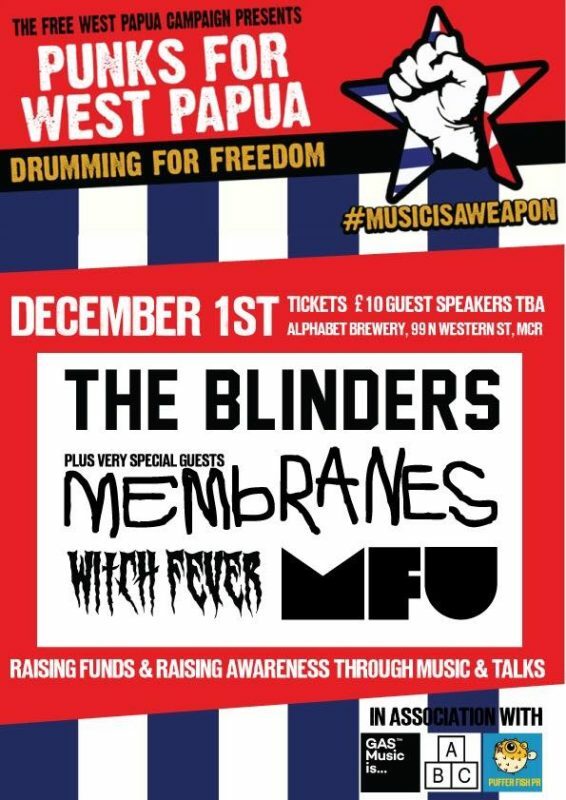 The launch of MCR Punks for West Papua is scheduled for December 1st because it is a historic day in West Papua. It marks the 57th anniversary of the first raising of West Papua’s symbol of independence, the Morning Star Flag. It is illegal to raise the Morning Star in West Papua. Doing so can bring charges of treason and a 15 year jail sentence. On December 1st people in West Papua, and all over the globe, will be participating in a Global Flag Raising to show their solidarity. Punks For West Papua Australia was first launched in 2016 as the brainchild of Jody Bartolo from the punk band Diggers With Attitude to shine a light on the threat of eco-cide from resource extraction, human rights abuses against the people at the hands of Indonesian security forces, and to inspire others to stand in solidarity for West Papuan independence. “Indonesia is not going to continue getting away with the slaughter of the indigenous rightful owners of West Papuan land” says Ash Brennan co-founder of Punks For 4 West Papua, Australia. The Australian punk rock community created a no-holds barred Australian wide benefit, involving over 50 bands in 7 cities around the country, making Punks For West Papua the biggest, and no doubt, loudest punk rock showcase in the nation’s history. “Australian punk is loud, very loud. Pernicious resource extraction in West Papua has also been hazardous to the environment and is a major contributor of Climate Change. But the world is now watching” says Brennan.